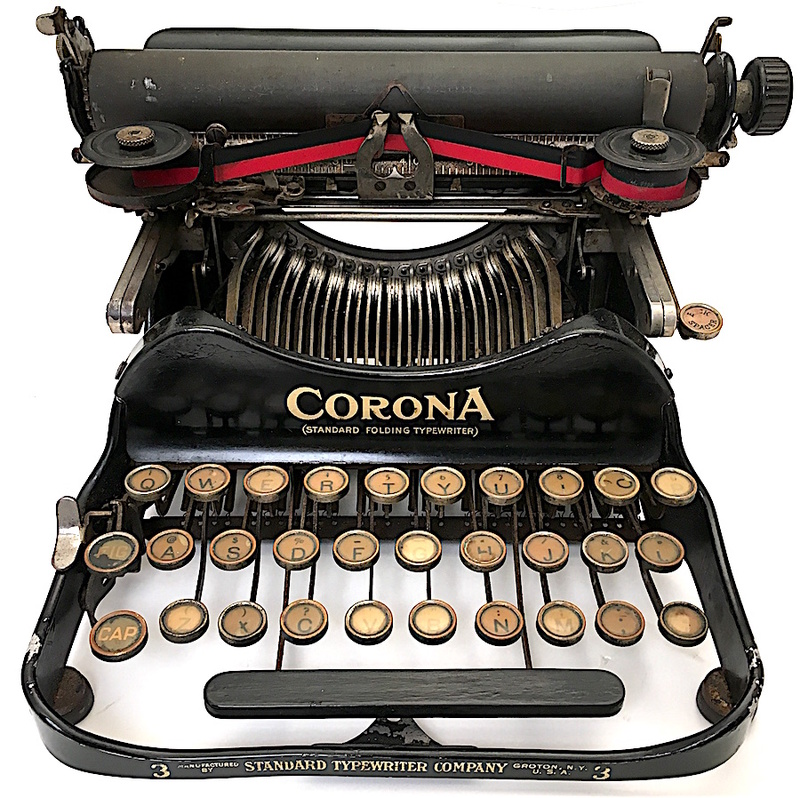 The Corona 3 was a wildly successful portable, selling well into the 1930s. 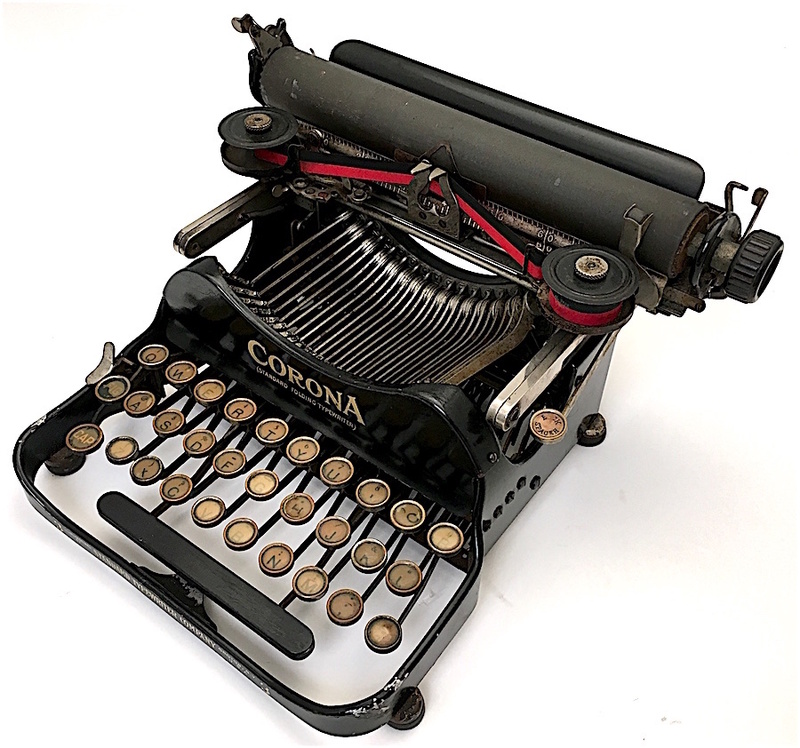 Introduced in 1912 by the Standard Typewriter Company (later the Corona Typewriter Company), this folding portable set the standard for portability and functionality in its day. I have a number of these in my collection, including the one featured here, which may be the earliest extant, unmodified machine in this line. Its serial number is 20226. 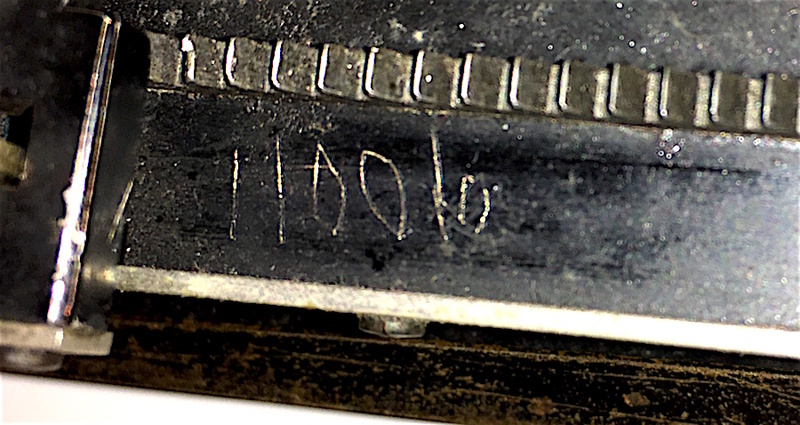 Its carriage number, a secondary number etched into the lacquer on the underside of the carriage, is 11006. If you subscribe to ETCetera, you hopefully read Ed Neuert’s article on this numbering scheme, entitled “Unfolding the Early Corona” (Nos. 106/107 – Fall/Winter 2014-2015). He outlined the development of the No. 3, describing its earliest iterations. He also offered a theory as to why the frame and carriage numbers are dissimilar. Subsequently, Type Oh published a post displaying his No. 3 with a frame number of 20007, the lowest to be found, and a carriage number of 15020. Neuert noted in his article that the lowest he had found was 20844/11645 (frame/carriage). Type Oh’s machine, however, had been modified and painted yellow. 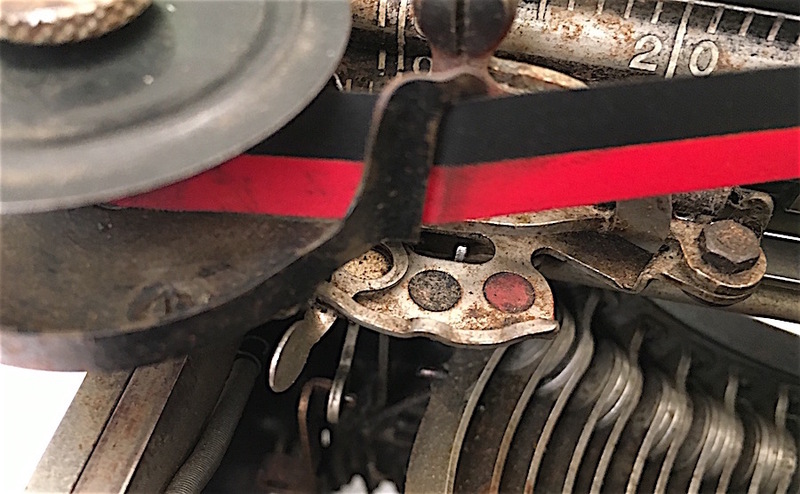 Commenting on the post, Neuert wrote, “It looks like someone inserted the carriage and guts of a newer Corona into the old frame of your machine. 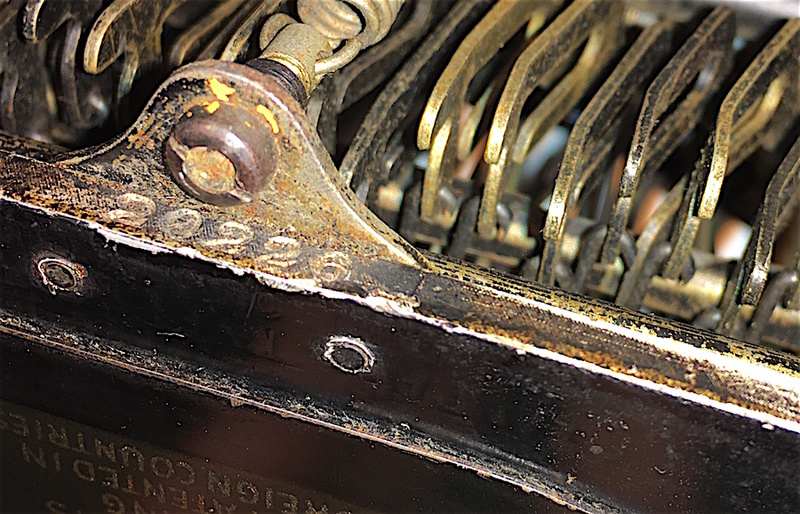 It is certainly possible to do this.” Who modified Type Oh’s machine is unknown, but it’s possible that a dealer made these modifications in the 1920s or 1930s, not some subsequent (unwary) collector. Throughout the run of the No. 3, Standard/Corona modified it, creating many variant models. Below are photos describing the earliest features (a more detailed analysis can be found in Neuert’s article). The famous pigeon logo on the paper table is absent on the earliest machines. The space bar is narrower. Neuert describes three variations of the typebar hanger on the No. 3. The earliest is a pivot bar segment. 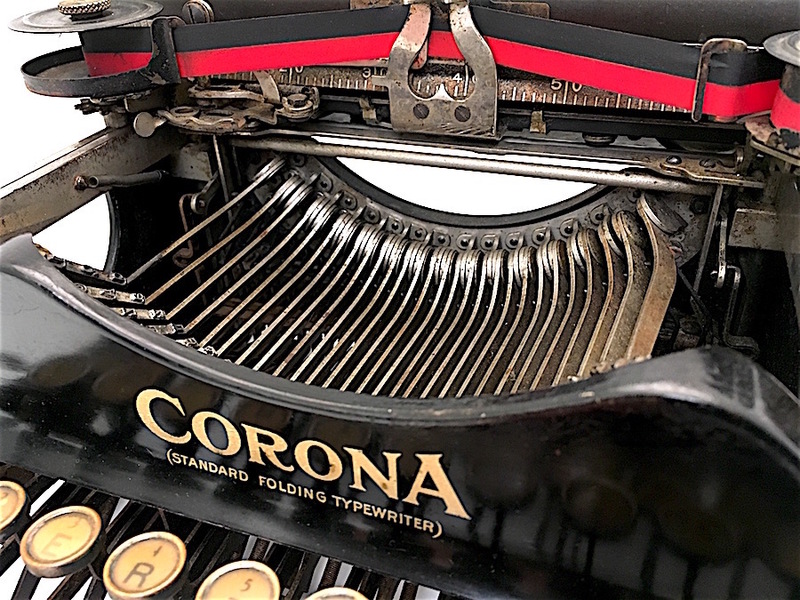 Called the parenthetical machine, the Corona displayed the words “Standard Folding Typewriter” in parentheses. 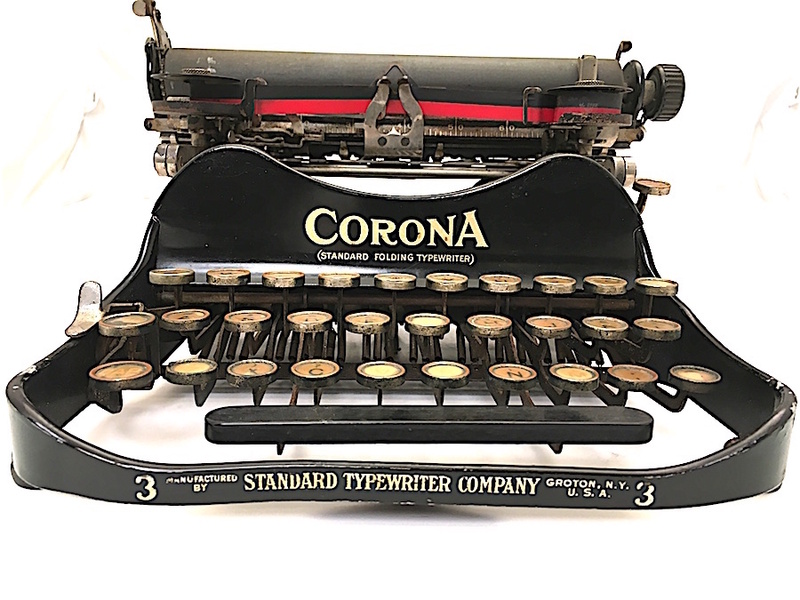 At the base of the machine are the words, “Standard Typewriter Company.” In 1914, the company changed its name to Corona. The earliest No. 3s had straight ribbon selectors, not the more common fan-shaped selecters. I note that the one of mine is slightly curved. The serial number is stamped on the back underside of the frame. The number on mine is stamped directly in the middle. Most others are slightly to the side. If you own a No. 3, check out the underside of the carriage. There may be a second number there, etched into the lacquer. Thanks for the glimpses of this very early machine. Your ribbon color selector is the fan-shaped, not the straight type. True, it is not precisely straight, but not fanned as in later iterations. Is your machine recorded at TypewriterDatabase.com? Good to note these early machines. Previous post: Long live QWERTY!